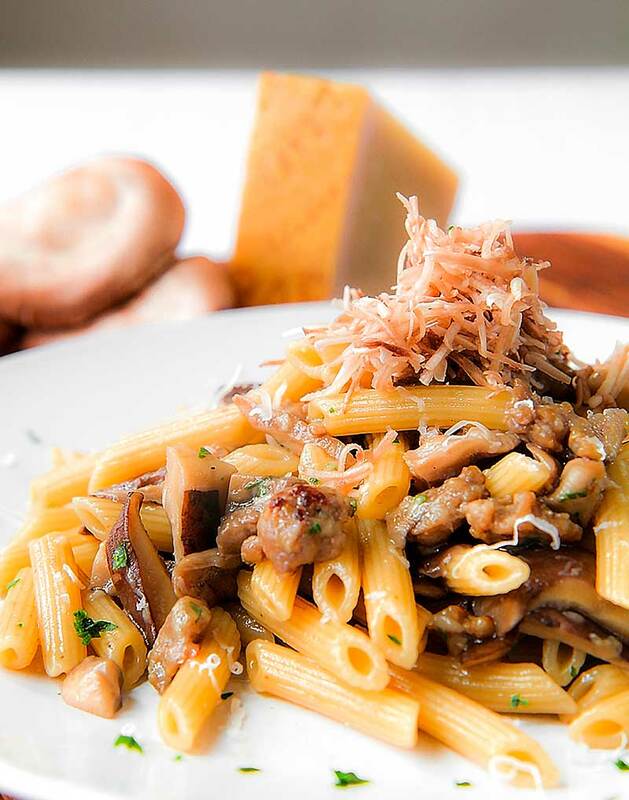 Mushrooms and sausage pasta is another classic Italian. 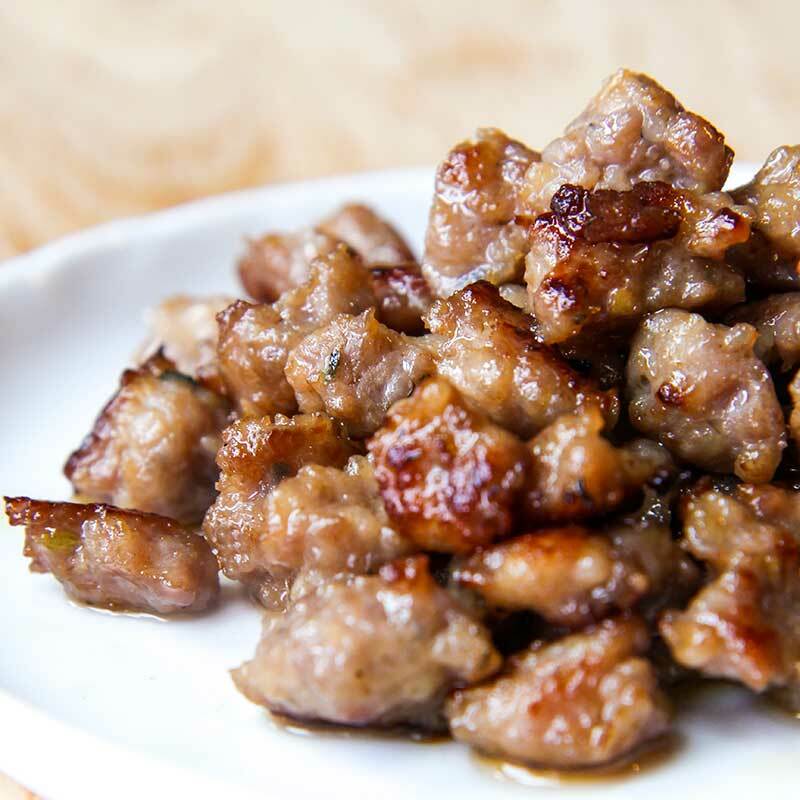 Mixed mushrooms pair perfectly with pork meat. 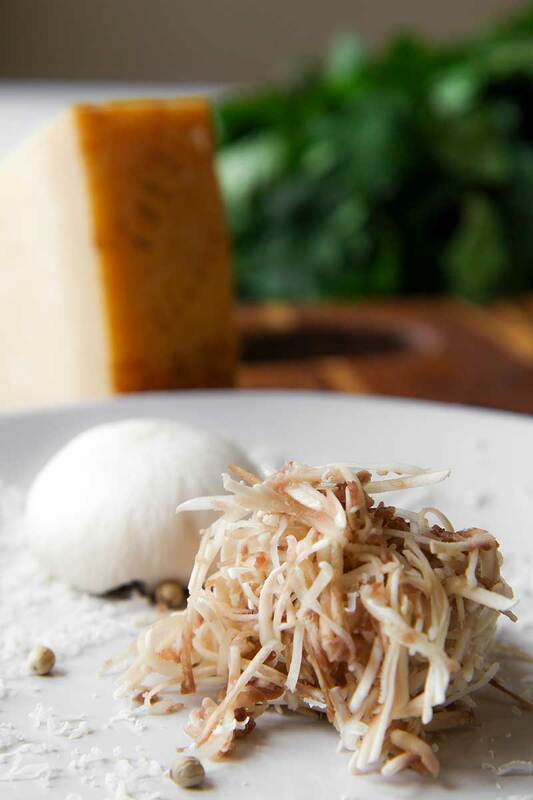 Fresh parsley and grated Parmigiano Reggiano, add more flavor. Even if is possible prepare this recipe with all kind of pasta, I prefer short size as penne or maccheroni. In this case I used extra thin penne, called in Italy Pennette. I like complete this pasta with grated raw mushrooms, to taste all the different fragrance and consistency of mushrooms! 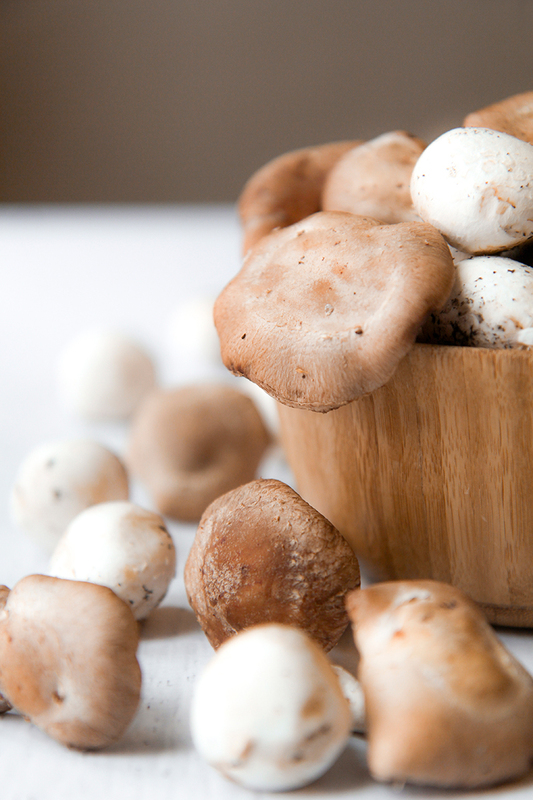 Clean the White and Shiitake mushrooms, and discard the stems. 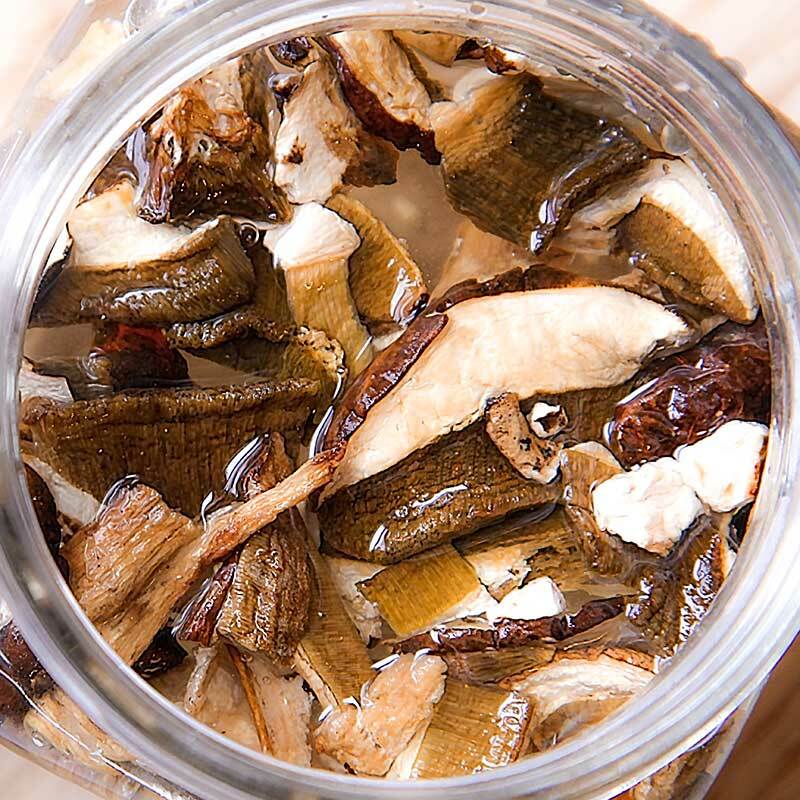 Soak the Porcini into a cup full of water about 15 minutes, then raise the mushrooms saving the water. Place the Porcini between two sheets of paper towel and dry them. Eliminate the sausages casing and separate the meat with by the hands creating small tufts. Place the tufts of meat in a large frying pan. 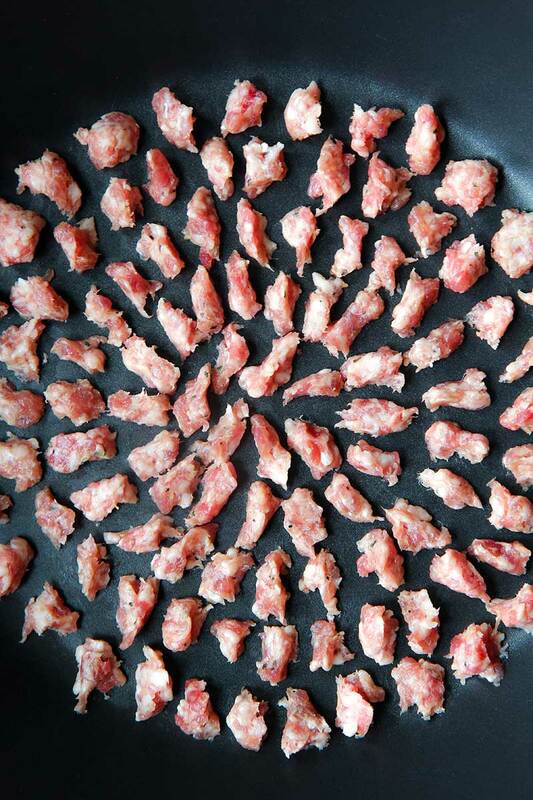 Be careful to do not overlap the pieces of meat. Cook the sausage over medium-low heat. The fat meat have to melt slowly and the sausage must be cooked in its own fat. When the meat begins to brown, raise the flame and stir-fry. Continue cooking until the sausage is golden brown, but not burned. Finally, drain the meat and conserve it into a dish, covered. 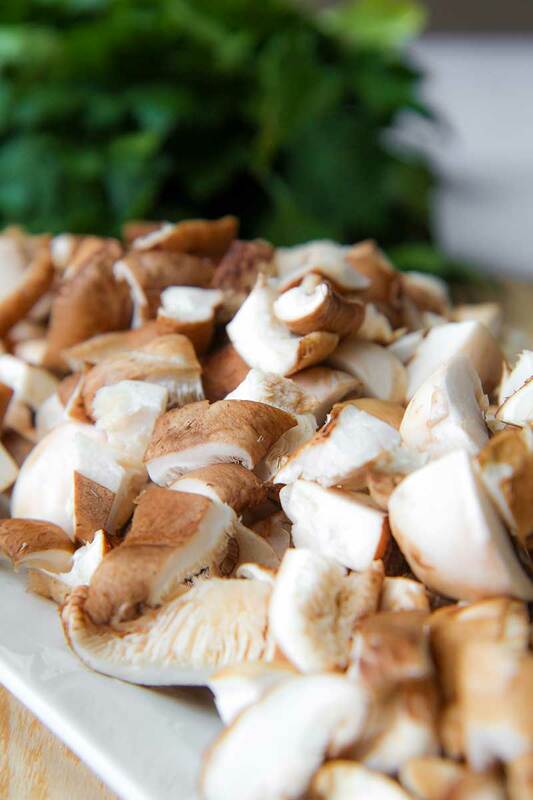 Meanwhile the sausage is frying into the pan, cut the shiitake and white mushrooms into big pieces, except 4 white mushrooms we’ll use to complete the recipe . When the sausage is golden brown but still juicy inside, peel and crush the cloves of garlic. Now, store the sausage tuft, and saute the garlic in the same pan, combined with the olive oil, until golden. After that, add the mushrooms without overlapping. Cook the mushrooms until golden brown, stirring frequently. Finally, add table salt as needed and pour the mushrooms in the same bowl with sausages tufts. Meanwhile the mushrooms are cooking, bring to boil a 6 quarter pot full of water. Bring to boil in another little pot also the water used to soak the Porcini. When the water is boiling, add 4.5 tbsp of cooking salt and cook the pasta. Drain the pasta 2 minutes before al dente, and pour it into the pan. Finish to cook the pasta adding the soaking Porcini water, a few spoons at a time, until very “al dente”. Finally add 4 tbsp of Parmigiano Reggiano grated, mushrooms and sausage, and stir fry one minute more. Grate the 4 white mushrooms saved before, and combine with 1 tbsp Parmigiano Reggiano grated, and 1 tbsp fresh parsley minced. Pour the pasta into the dishes and complete with the cheese, mushrooms and parsley mixture. Do not forget a dash of white pepper before serving! Meanwhile the mushrooms are cooking, bring to boil a 6 quarter pot full of water. Bring to boil in another little pot also the water used to soak the Porcini. When the water is boiling, add 4.5 tbsp of cooking salt and cook the pasta. Drain the pasta 2 minutes before al dente, and pour it into the pan. Finish to cook the pasta adding the soaking Porcini water, a few spoons at a time, until very "al dente". Finally add 4 tbsp of Parmigiano Reggiano grated, mushrooms and sausage, and stir fry one minute more. I just made this and it is delicious! I didnt have the porcini but it was still great with the white mushroom. Thanks for the recipe! This one is a keeper in my book. Fabulous recipe for a winter’s evening. 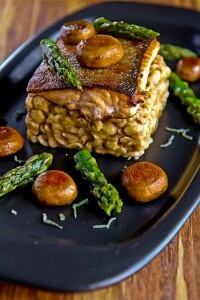 Love reading Filippo’s recipes.